Christmas might come early this year for millions of Americans who stand to see their credit scores boosted -- without their having to lift a finger. This "gift," which could see them qualify for better credit cards and lower rates on mortgages and pretty much all other borrowing, is a result of two changes. The first involves a reform of the credit scoring system that is used in 90 percent of lending decisions. The second, so far introduced by two of the Big Three credit bureaus, sees home rental payments being counted when calculating scores. If the only major black mark on your credit report is a result of medical debt, its impact should be reduced. FICO reckons that, on average, those in that position could see their score rise by 25 points on its 300-850 scale. Debts that have been in collection and then fully paid should no longer count against consumers' scores. Those who have short or limited credit histories can expect "a more refined treatment," in FICO's words. This might see people in that position being approved for more credit at lower interest rates. Don't expect these changes to be applied instantly. Trade journal Collections and Credit Risk quotes a FICO spokesperson as saying his company plans to pass the new version to credit bureaus sometime in late August or early September, after which they are going to begin testing and verification processes. Only when those are completed should lenders be able to access the new scores. It's worth noting that these changes are intended to improve lenders' abilities to predict who's likely and who's unlikely to repay a loan promptly. So those with terrible credit and those with excellent credit may not benefit at all -- or only a little. Many of those who rent their homes are currently at a disadvantage by comparison with mortgage payers as, generally speaking, the latter's home loan payments are reported to credit bureaus while the former's rental payments aren't. This means renters with perfect on-time payment records get no benefit to their credit reports and scores from their financial responsibility. Now Experian and TransUnion, two of the Big Three credit bureaus, are willing to count rental payments -- and are encouraging landlords to report them. Of course, this is a double-edged sword: those who pay late or skip payments could see their scores plummet. But responsible renters could see their scores rise rapidly. Back in June, TransUnion published a report estimating the impact counting rental payments might have on subprime consumers. It found that very nearly 80 percent of those saw their score increase just one month into a new apartment lease that was reported. Just over 40 percent saw a rise of 10 points or more over that short time. Over multiple months and years, such rises could build, putting renters on a level playing field with homeowners. And that would be great news for first-time buyers, many of whom currently find it hard to qualify for the best mortgage rates because their scores are too low. As The Los Angeles Times recently highlighted, it's not just rental payments that aren't currently reported. Cable and satellite television subscriptions, and cellphone and utility bills are among the items credit bureaus rarely or never hear about. Maybe one day consumers are going to get the credit they deserve for all their on-time payments. If you're among the lucky ones whose scores get a boost from these reforms, you shouldn't expect the outcome to be life-changing. But even a bump of 10, 20 or 30 points could open up new possibilities for you. Such a rise could take you over a lender's threshold: if your score's at 690 points now, getting to 700 or 720 could qualify you for better rates and products. Certainly, such a rise should prompt you to explore your options, perhaps checking out rewards credit cards that could provide you with genuinely valuable benefits and perks. If you already have such a card, maybe you could get a better one, with lower rates, and miles, points or cash back that better suit your lifestyle. 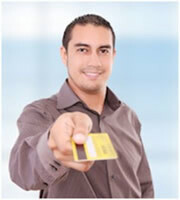 The IndexCreditCards.com credit card lists provide an indication of the sort of credit you need to stand a reasonable chance of being approved for each product. You might even want to see if you could refinance your mortgage or get a better deal on your auto loan. But how will you know whether and when your score changes? Perhaps your first step should be to sign up online for a free credit score monitoring service like that offered by WisePiggy.com. 0 Responses to "Credit score reforms could put better credit cards in your wallet"